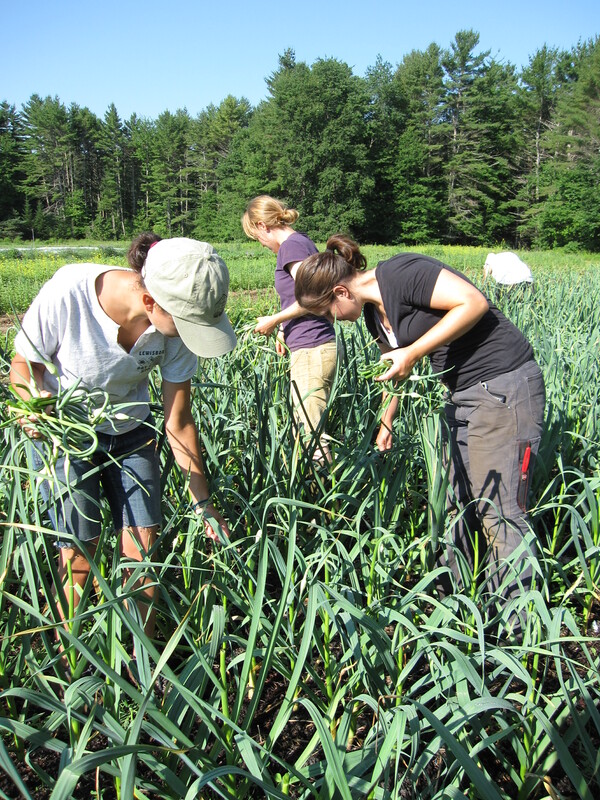 Garlic scapes, the flower spike of the garlic plant, are an eagerly awaited annual treat on the farm. We cut the flower off so that the garlic plant will put more energy into the bulb, resulting in a larger head of garlic. Each garlic plant will produce only one spike, so it is a one-time harvest. But what a beautiful and delicious harvest. We chop scapes up and use them in place of garlic in any dish. But our favorite method is simply sautéed, as described in the recipe section. Cecilia, our toddler, will eat them by the fistful! You may notice that the broccoli is a bit less lovely this week than before. We planted three varieties for this first broccoli harvest, and while the one that matured first looked gorgeous, the second two varieties appear quite a bit less perfect. But they still taste great, and are a reminder that on the farm, flavor, not looks, is everything! Margo, Hanni & Emma (with Laurie in the background) harvesting garlic scapes amidst a tangle of garlic planted last October by many of you! Other news on the farm: our short-tern volunteer Margo went home to New York today, after giving us three weeks of hard work and a wonderful attitude. We’ll miss her! This week we will have our organic certification inspection, an important day of the year for us (we’ll tell you about it in next week’s letter). And we hope that we will finally all just be healthy for a week — we’ve never known a June so full of one illness after another! But luckily, with great weather, a great crew, and six years of experience now behind us, we seem to have made it through in great shape. And for this we feel lucky and grateful. We hope you’re enjoying all your veggies. Have a wonderful week, and have fun cooking!